PowerPoint presentation by Sara Stace to the 5th International Urban Design Conference, Gold Coast, September 2011. A publication on the planning and design of cities and towns in Australia and New Zealand. A regular Blog and twitter feed on urban design around the world. A website with over 300 publications and 400 case studies on urban design in the UK. CABE was the UK government’s advisor on architecture, urban design and public space from 1999-2011. 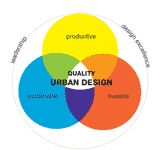 Links to other resources on urban design can be found on the Protocol principles pages.